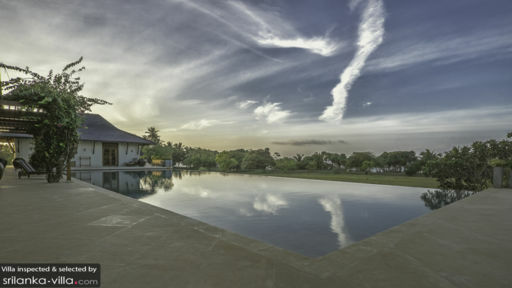 Built at the heart of a sprawling 23 acre estate, Villa Ranawara allows its guests to revel in the luxuries of the modern world while relishing the discretion of its private beach. Tastefully furnished in a colonial style in neutral colours, Villa Ranawara has five bedrooms spread out in various parts of the two-story main villa, each with a unique view of the ocean or the beautiful gardens. For guests seeking more privacy, Villa Ranawara has two garden bungalows located 50 meters from the main villa building. 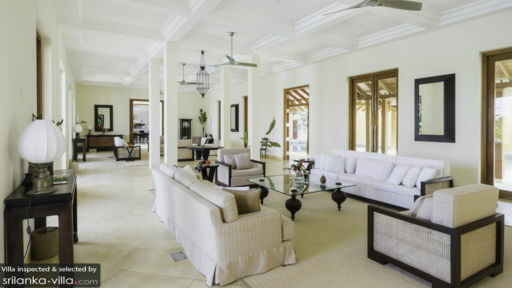 Access to the private beach area is just a short walk from Villa Ranawara which is ideally located on the extensive soft sandy beaches that Tangalle is renowned for. 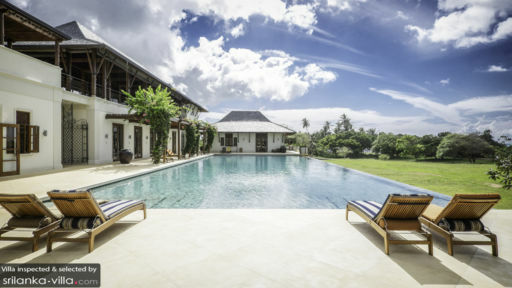 The large 30 meter pool with a view of the lush green gardens of Villa Ranawara can be the ideal getaway in case guests get ‘tired’ of the beach. Staying in such a grand estate such as Villa Ranawara, guests have the possibility to explore every nook and corner of the residence. The large main villa provides a choice of several living spaces. The spacious ground floor offers an indoor sitting room in a neutral, soothing colour scheme with comfortable sofas and French windows leading to the pool. For guests who want a 360 degree view of the expansive gardens and the Indian Ocean, the first floor sitting room would be an ideal setting. Villa Ranawara also has a fully equipped library with comfortable sofas and arm chairs and a cinema room on the first floor of the main villa. The fully staffed Villa Ranawara also provides butler services to ensure that all your needs are fully catered to and a live in chef to indulge the taste buds of its guests. For those who wish to spoil themselves even more, Villa Ranawara offers spa facilities in the massage pavilion located a little away from the main villa to ensure privacy and silence. Villa Ranawara is located very close to one of the main national parks for bird watching, the Kalametiya Bird Sanctuary. For those who are eager to see more wildlife, other national parks including Yala National Park and Udawalawe National park, home to leopards, elephants and endemic sloth bears, are just a few hours away. Ranawara is a stunning haven for relaxation. Once we arrived, there was no need to leave during the entire stay. We were a large group mixed with adults and teens and there was something for everyone. We spent a lot of time in the massive pool gazing out over the estate watching birds, peacocks and other wildlife while listening to the crashing waves. In addition to the cricket match with the staff, the teens enjoyed the cinema room with movies, video games and board games. The study provided a nice space for the girls studying for their upcoming exams. The huge outdoor living room on the first floor was our favorite place to watch the sunset and have predinner nibbles and drinks. The director organized massages for us in the spa room overlooking the estate grounds and they were sublime! The food was delicious! We had Western and Sri Lankan dishes and they were all wonderful. The chef was a master at utilizing local, fresh ingredients. For those that did want to venture out, the director arranged a trip to the Kalametiya Bird Sanctuary which is very near the estate. There were other similar trips that could have been arranged nearby, however, who could be bothered to leave the doting staff and lovely surroundings.